Inspired by games such as EVE, Space Trader, Master of Orion, Pirates! and many other classic computer RPGs. 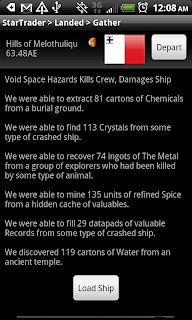 If you enjoy adventure, Action RPG or SciFi RPG with complex depth you may enjoy Star Traders space role playing game. Full character control and customization. Travel the galaxy in this turn-based strategy/role-playing game. Features 5 unique skills, 8 character classes, 100 different capital space craft. Customized your craft and ships with 36 different improvements.